Aristaeus was the son of the Greek god Apollo. He had many occupations including keeping bees. He liked women as well and when he saw Eurydice, the love of the musician Orpheus, she had to run away from him. In her haste she did not look out and got bitten by a poisonous snake. It was a fatal bite and Orpheus was broken hearted. Aristaeus was also inconsolable, because all his bees then suddenly died. Like a real Greek man he went to his mother to seek comfort. She told him straight: because of him Eurydice died, and his bees died because of the sorrow of Orpheus. As a penance he had to sacrifice bulls and cows to the gods. After which a swarm of bees rose up from one of the corpses. That is how Aristaeus was able to teach humans how to keep bees. Nowadays too, bee colonies just seem to disappear. You could believe that the gods are once again angry because of something a human being has done. Scientists cannot find why so many bee colonies are disappearing from the face of the earth. The phenomenon, called Colony Collapse Disorder (CCD) is worrying because bees not only make honey but are also responsible for the fertilization of many crops. In 2006 this mysterious disease was discovered in America, European countries like the Netherlands, Belgium and Greece followed too as bee colonies (containing from 20.000 to 60.000 bees) vanishing. The cause could be urbanization, or a new pesticide, or a new insect-enemy, and it is heard on the grapevine that it might even be mobile phones! Lesvos is full of radio masts - for telephone, television, radio and all that modern life requires. On the tops of all our mountains you will find forests of antennae pylons. And Lesvos also has masses of beehives. If the Lesvorian beekeepers ever want to enter a new record in the Guinness Book of Records they could line up their hives to a form a line many miles long. A few times in a year their blue and white hives are moved to other places: in the spring they are put out in the meadows amongst the spring flowers, and in the autumn they are moved up into the pine woods. Bees can fly some 15 miles an hour, to make a pound of honey they would have to fly the equivalent of three journeys around the world, because one bee produces in her life time only one twelfth of a teaspoon of honey. Bees communicate with each other by dancing and they are supposed not to be aggressive creatures. Although if they feel their beehive is threathened, they may attack. But when does a bee feel threathened? Plenty of walkers on Lesvos have paid for their ignorance with many a sting, and have had to visit the hospital to get some injectors — just for daring to walk past a row of bee hives. 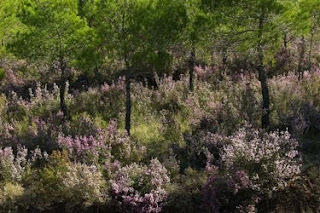 But walking in the pinewoods at this time of the year is a great pleasure. The beehives are in the pinewoods, because of the heather growing between the trees and that is now beginning to blossom. On the mountains between Olympos and the main road between Kaloni and Mytilini you will find many fields of purple heather shining between the bright green trees. And while the wind is so lovely as it plays with the needles of the trees, above the colourful heather the bees buzz their wings at 11.400 times a minute making their wellknown zooming humming noise. Besides ouzo, olive oil and goat cheese Lesvos also exports honey. There is the honey that is just called Lesvos honey, made in cooperatives, and their are local individual sellers like in Stipsi and Karini and recently (in 2007) the Kamperos family opened a honey bussiness called ‘Melostagma’ in Skalochori. As well as honey they sell pollen, propolis and Queen bee jelly (known as ‘Royal’ jelly). Pollen is the fertile part of flowers that the bees collect as well as the nectar. Propolis comes from the resin of trees and Royal jelly is made by the socalled nurse-bees. Like the name suggests, it’s a very healthy product. After I stayed some time amongst the heather, thinking of all the healthy products this island has, I decided I would soon make a visit to the Kamperos family in order to buy some of their bee products (Melostagma honey can also be bought along with other brands at the cooperative in Molyvos).